Republicans tend to love two things: Fiscal conservatism, and strong national defense. Unfortunately, these two often contradict each other. A strong national defense, at least under our current system, requires tremendous amounts of government spending. While other Western nations utilize conscription (a draft) and focus more heavily on National Guard type units and defensive foreign policies, the United States spends lavishly on luring in voluntary recruits, maintaining full-time land, sea, and air units, and engaging in active foreign interventions. Being a superpower ain’t cheap. And, ironically, it’s those who complain most about the national debt who tend to want to bolster, not ease, America’s status as an aggressive superpower. This includes President Donald Trump, who wants to increase U.S. military spending by a whopping 10 percent per annum…and pay off the national debt within eight years. Those two just don’t add up, at least not without unheard-of cuts to civilian federal spending. It was preposterous for Trump, who wants to boost defense spending and spend up to $1 trillion on rebuilding America’s infrastructure, to suggest that he could reduce the federal deficit. It’s downright laughable to suggest that he can accomplish that miracle while simultaneously cutting taxes. Yet, amazingly enough, Trump’s administration is bragging about proposing the biggest tax cuts ever. The cuts would include removing the 39.6 percent tax bracket for earned income, leaving 35 percent as the highest, and reduce the top tax rate for all businesses to 15 percent. 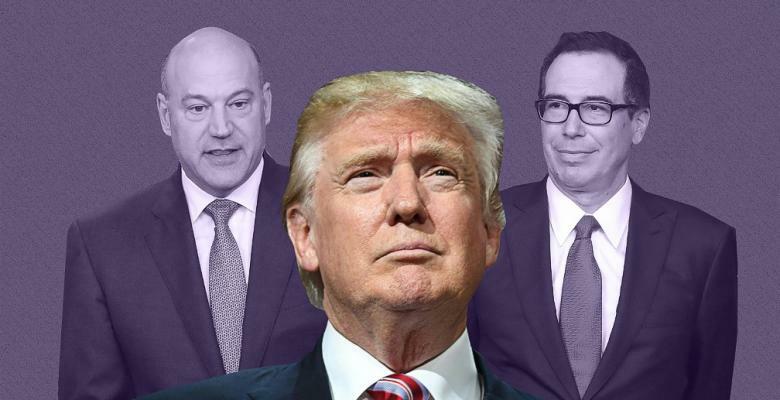 The Trump tax plan removes several tax brackets and increases some deductions, with critics claiming that businesses and wealthy individuals receive far greater benefits than everyone else. As expected, the tax proposal has been met with liberal anger and incredulousness. Even conservatives in Congress are skeptical, viewing Trump’s tax-slashing as unrealistic. No attempt appears to have been made to reconcile the deep tax cuts with Trump’s widely-publicized goals of military rebuilding and infrastructure investment. There has also been nary a peep about the national debt, which will soar under this tax plan. President Trump’s Treasury Secretary, Steven Mnuchin, claims that the tax cuts will “pay for themselves” by stimulating economic growth, thus preventing the deficit from deepening. While Mnuchin is predicting three percent real GDP growth, liberals strongly disagree and have referred to the tax plan as “mathematically impossible.” Fears abound that Trump’s broad proposals could become enormous loopholes for wealthy Americans, who could try to declare most of their earned income as business income and cut their tax rate to 15 percent. Such a loophole would only be available to those with any sort of business ownership, potentially further increasing the wealth gap. Coming from the self-proclaimed “king of debt,” the Trump tax plan should be rejected by Democrats and Republicans alike. It is likely a short-sighted proposal intended to boost Trump’s popularity with the moneyed class while sparking temporary economic growth. Like with Reaganomics, the damage is hidden by time and will only be felt after Trump has retired back to Mar-a-Lago. A worrisome possibility for Democrats is that Trump’s tax proposal could gain traction by offering a one-time lower tax rate for profits accumulated overseas by U.S. multinationals. Currently, some $2.6 trillion are being held abroad by American corporations to avoid taxes. Trump is proposing a one-time 10 percent tax, versus the 35 percent usual corporate tax, for bringing those profits home. If U.S. multinationals took advantage of this temporary reduction in taxes and brought home all $2.6 trillion, the national Treasury would net a cool $260 billion. However, this $260 billion revenue boost would be a singular occurrence and, under Trump’s radical tax cuts, quickly used up. Short-sighted members of Congress, unfortunately, might be tempted to pass the tax cuts in order to get credit for bringing home the hoarded money. When the $260 billion is completely spent, however, Trump’s tax cuts will remain in effect and keep the U.S. Treasury perpetually underfunded. If the tax cuts do not generate the growth Mnuchin and Trump promise, a fix is unlikely to be forthcoming: Proposing tax increases are akin to political suicide. It’s easy to propose cutting taxes, but very unpopular to propose raising them. Few in Washington have likely forgotten George Bush Sr.’s ill-fated promise of “no new taxes.” By sharply cutting taxes, Trump is passing tremendous risk on to any successor who must clean up his economic mess. Likely, this would be a Democrat. This leaves Trump and his successors faced with the possibility of sharply cutting government spending, which could trigger a recession, or trying to sell massive amounts of Treasury bonds to make up for the lost tax revenue. Both options are bad, and America may not be able to stomach another steep economic contraction so soon after the Great Recession.